I still like to go back to England where I spent the first fifteen years of my life. Every visit reminds me of where I am from. London is not where I was born - Wolverhampton is - but I think of it as my home town and I think of myself not as an ex-pat but as a native who happens to live somewhere else. I love the city's vibe. There is always something new, creative and hip that co-exists with the historic and anachronistic. It's a great mix. There are, however, times -- such as the night I spent at Claridge's, the grande dame of posh hotels in London - when I can't decide whether life is better for a contemporary American or a Brit from another century. 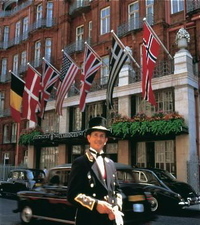 While London certainly has its share of five-star hotels, few can claim as much old world charm as Claridge's, built in 1898. From the doorman's tip of a hat for the ladies to the Art Nouveau and Art Deco décor, the hotel is redolent of good manners and a gentler age. Concessions to the 21st century include permitting cell phones and cigars in the lobby where the walls are lined with black and white photographs of British royalty and ours -- Jackie Kennedy in evening gown and tiara. What caught my eye though was an elevator called the Ladies Lift located near a discreet, side entrance to the hotel. When I stayed at the hotel, I entered through the front door, with head held high, thank you. The experience was memorable for a number of reasons, not the least of which was I kept getting the giggles. The room I was given had a sublimely comfortable bed but the bath tub was extra long and so deep I was sorry not to have goggles with me. Its fixtures took a bit of trial and error, too, especially the mechanism marked "Waste," located just to the right of where one's head goes. It had to be lifted in order to send the bathwater down the drain. For the mechanically-challenged, help could be summoned by pulling one of the two chains that hung from the 15-foot ceiling -- one marked "Maid," the other "Valet." Maybe "room service" meant something else to the Victorians. Ever since that night, when I check into a hotel room with a very ordinary shower/bath that looks like every other hotel room with a very ordinary shower/bath, I think about the tub at Claridge's. I wonder what would have happened had I pulled the chain marked "Maid" or, indeed, "Valet." Susan Davidson was born in a trunk. Not literally, but her father, who was English, ran a theatre and wrote plays. Her mother, who did things in fashion, was a refugee from Vienna, Austria. They met, married and had her in England. This explains why both theatre and travel are in her DNA. As Arts Editor of Washingtonian magazine -- a job she just left -- she wrote a column monthly on theatres, museums, music and dance in Washington, D.C., where she lives. Susan specializes in cultural travel. Her works has been published in the Washington Post, Los Angeles Times, Jewish Week, Preservation Magazine, and "O" the Oprah Magazine.